As a long-time, avid camper, the significance of a compass is not lost on me. Once upon a time, I didn’t really see the point in using one. In fact, I wasn’t even sure exactly how to use a compass! The joke was on me when I went camping with some buddies as a young adult. My memory fails me on the exact reason, but somehow our group got split up. One pal of mine and I were left with a traditional map and no compass—neither of us at the time thought a compass would lend any value. Long story short, it took us hours to relocate our campsite. It was dark, we were cold and tired, and the remainder of our group had spent the night making fun of us. As you can probably expect, I went home from that trip and picked up a compass. I learned how to use it, and now I never go camping without it. Basically, a compass is a tool used to point you in the right direction—literally. It is a navigational instrument that shows direction using the cardinal geographic directions. The face of a compass typically shows what is called the compass rose. There are four main directions on the compass: north, south, east a west. Directions between these are described based on the two locations they fall in the middle of. For example, directions between south and west would be called southwest. Compasses use magnetism to ensure accuracy. Every compass is set to magnetic north. Compasses have a magnetized needle pointing out from the center that aligns itself with the horizontal aspect of the Earth’s natural magnetic field. Because this magnetic field exists, it exerts a torque on the special magnetic needle to pull it north. No matter how much you move or spin a compass, the needle will always settle into it equilibrium orientation—north will always be north. In the same way, no matter where you stand, north will remain the same. If you stand with your back facing north holding a compass straight out in front of you, the north mark will be pointing at you. If you were to turn around so that you are now facing north, the needle would be pointing away from you in the same direction as before. In a world full of smartphones and advanced GPS technology, what would we ever need something as old-fashioned as a compass for? As it turns out, all of our highly comprehensive and complicated technology has battery life. Who knew? In the case that you happen to be camping in the middle of nowhere and your high-tech GPS and map device dies, you’ll be very happy to have that compass as a backup. 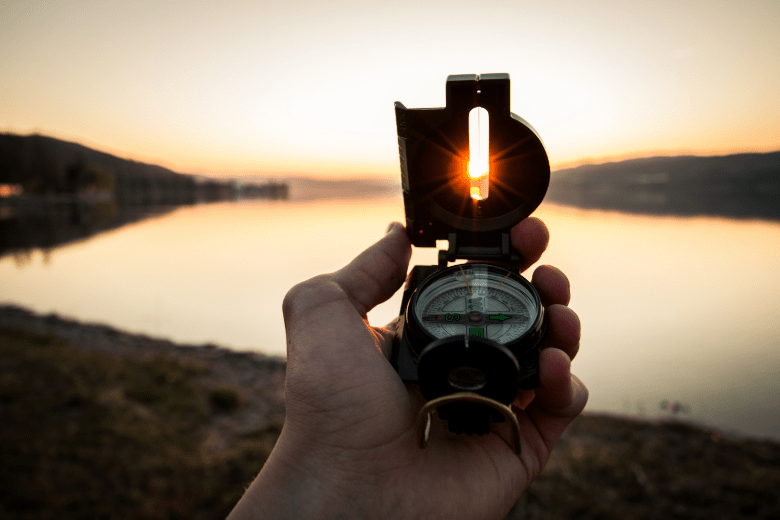 You can use a compass to figure out where you are, what’s around you, and how to get where you need to go. Even if your battery survives—maybe you brought along one of those fancy portable chargers—the chances you will actually get a signal and have service in the middle of the woods are slim. On top of that, you can easily break or lose a phone. Many people won’t even take their phone camping for the sole reason that they don’t want to smash it on a rock or drop it in a river. You should never fully rely on your phone to get you where you need to go while camping. In addition to their magnetized need, navigational markings, arrows, and lines, some compasses have cool features that do different useful things. Many compasses are set on a flat surface called a baseplate that extends into a miniature ruler. When you are using a map, having a ruler handy is great for figuring out exact distances. Also, some compasses will have a magnifying lens to help you read maps. Some compasses include a luminescent indicator. These help hikers and campers who travel before sunrise and find themselves traveling after dark. More advanced compasses include a sighting mirror. This helps you aim more precisely when you are following an exact bearing from far away. It is doubly handy as an emergency signaling devise. Most common compasses you will find in are either North or South America specific. Some more complex compasses will use a global needle. The global needle compensates for differences in the magnetic field at a global level, allowing you to use it during international travel. Those who enjoy hiking mountains and climbing will want to look into a compass that features a clinometer. Rather than just measuring horizontal cardinal directions, a clinometer measures vertical angles, or the steepness, or a slope. Yes, it’s finally that time! Now that you have learned a little bit about what a compass is and what it does we can jump into how you can actually use one. We mentioned some of these components earlier, but I’d like to run through them again because they are essential to understand how a compass works. The baseplate is simply the base of the compass. It is typically clear so that you can use it in conjunction with a map. At least one of the edges will be straight, and it will have a ruler or two printed on it—also for map use. At one end of the baseplate, you will usually see a compass arrow. This is the direction-of-travel arrow. When you are following a bearing, this is the arrow you will use to point yourself in the correct direction at all times. Inside the actual compass component is the rotating bezel. Some experts also refer to this piece as the azimuth ring. It is the outer circle of your compass that has the 360-degree markings for exact directional bearings. The rest of the compass components are located inside the needle housing. Right above the bezel, you’ll see the index line. This is used to read the degree you are locating. The magnetized needle is anchored at the center of the needle housing and always points out towards the magnetic pole, also known as north. Finally, you have your orienting arrow and orienting lines. These are used to orient the bezel and correctly align your north and south lines with a map. Declination can be a tricky concept to master. In most places in the world, magnetic north—which is where your needle points—will differ slightly from “true north.” True north is a geographical direction that is represented on maps and on globes by the lines of longitude. The magnetic technology used in a compass points you to magnetic north, which is a point in the arctic regions of Canada. The reason these two locations differ is that this magnetic point is continually shifting based on the Earth’s magnetic field activity. Basically, there are varying levels of degree differences between where your compass will point north and true north. This difference is referred to as declination. The difference could be as much as 20 degrees or as little as a few degrees depending on where you start. However, a single degree of error could set you off your course by over a mile. Therefore, you should adjust your compass accordingly. You can make up for this difference by researching the declination value in your area before you set off on your adventure. I recommend consulting the National Oceanic and Atmospheric Administration. Their site features a calculator to figure out your declination values. When you figure out your declination values, you can adjust your compass. The exact way to do this varies by compass, so you’ll have to do a little research to get specific instructions. Basically, you will have to rotate the bezel or the orienting arrows to make up for the difference. Some people like to have a compass just to know what general direction they are going. Perhaps they were told the best place to camp was on the east end of a lake. A compass can get you there easily. The first thing you have to do is locate east on your compass housing. Turn your compass until you see that east lines up directly with your direction of travel arrow. Quite simply, that is the direction you want to walk. You can do this for any direction. Just remember that you should always point the direction of travel straight out in front of you, and whatever direction is lined up with that arrow is the direction you’re moving. Before you start moving, always double check that the red north needle is pointing at north on the compass housing. If it’s not, something is not right. While you are walking, look down at your compass often. It’s easier than you think to stray to the right or the left. Consistently looking at your compass will keep you on a straighter path. Another pro tip is you keep an eye on the sun as well. Most of you probably know that the sun rises in the east and sets in the west. Additionally, around noon the sun is roughly in the south when you are in the northern hemisphere. 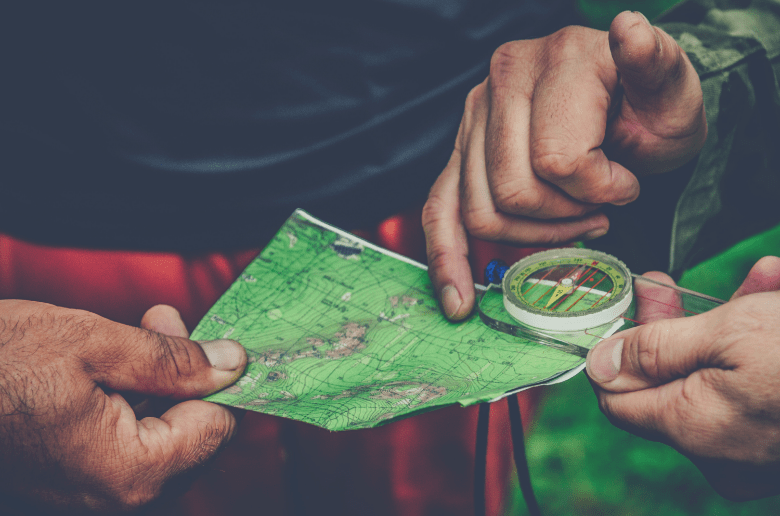 If you have decided to get serious with your compass and are using it in tandem with a map, you are going to have to orient your map. While the phrase sounds a little intimidating (I thought so too, at first), it’s really a simple process. Note, you shouldn’t orient your map until you have set your declination. First, set your compass down on the map you’re using with the direction of travel arrow pointing to the top. Rotate your bezel that the north is lined up directly with your direction of travel arrow. They should both now be pointing to the top of your map. With these arrows still pointing up, slide your compass’s baseplate over until one of its straight edges is in alignment with one side of your map. Finally, hold both the map and your compass steady as you rotate your body. Keep spinning slowly until the end of the magnetic needle is within the orienting arrow’s outline. You have now oriented your map so that you can use it with your compass and remain accurate along the way! Following a bearing is what gets you from one place to another. The bearings you follow will always vary based on your starting point—they do not correlate with your end location. For example, if you travel from point A to point B, your bearings may be 115 degrees. However, if you have a friend who is also traveling to point B, but they have started at point C, their bearings will not be 115 but rather a different number based on where they are in relation to point B.
It’s as simple as this: if I am traveling from South America to North America, my general bearings will be north-pointing. If my friend is also traveling to North America, but they have started in Canada, their general bearings will be south-pointing and totally different from mine. To find your bearings, set your compass on your map. Align the straight side of the baseplate from your current location to your destination on the map. If you do this properly, your direction of travel arrow should be pointing in the general direction that you are trying to go. Once you have set this up, rotate the bezel until you see that the orienting lines are matched up with the north-south gridlines. You can also look to see that the orienting lines are parallel to the left and right edges of your map. Locate your index line and see what number it’s lined up with. That number will be your bearings. Use this number from now on to get to your desired location. Remember, always hold the compass with the direction of travel arrow pointing away from you. Holding the compass steady, rotate your body until the magnetized needle is inside of the orienting arrow. Once you have done this, your direction of travel arrow should be lined up with the bearings number you just figured out. Keep an eye on your compass and start walking! Using a compass may seem a bit complicated at first but take it from someone who knows: it’s worth it to learn. With a map and compass, you will never get lost again. 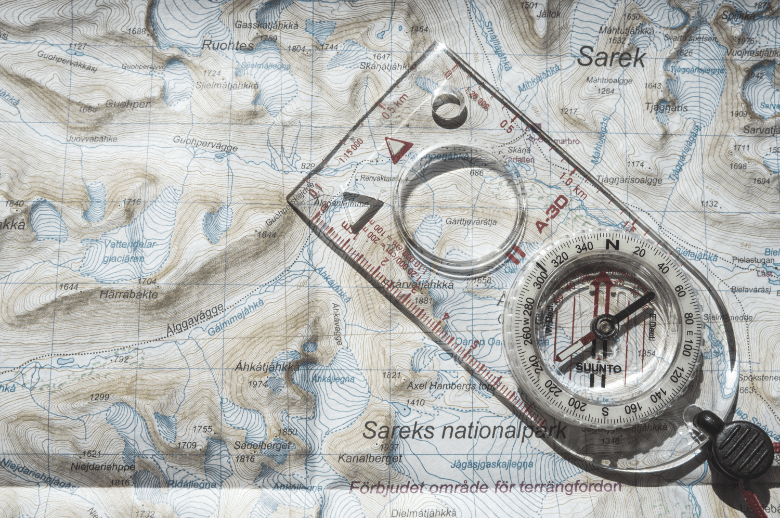 You can’t always rely on technology out in the wilderness, but a compass will always work. Just don’t break it or lose it!